If it’s winter in your part of the world, I’m sure that you’ve noticed that you’re not getting as many yummy eggs from your flock as you’re used to. No worries! Follow a few tips below to ensure that you’re eating omelets and quiche in no time! Give them some light! Chickens lay best when the days are longer so shorter winter days can cause egg production to drop. Try setting up a light in their coop (even Christmas lights have been reported to work.) Use a timer to make things easier on you and aim for about 16 hours of daylight. Are they spring chicks? The older the hen, the less eggs you will get. Period. To keep your cartons full, make sure your chickens aren’t past their prime. Feed them right. If you’re not already doing so, consider adding laying pellets to their diet and be sure to give them as much green as possible. If you have winter weeds popping up, be sure to treat them with some! Make your chickens comfy. Though this may not necessarily give you more eggs, it is an important part of keeping chickens though the winter. 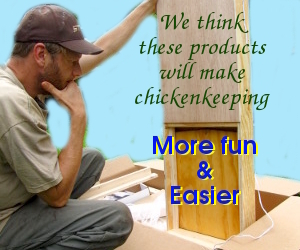 The coop doesn’t need to be air tight (ventilation is important) but it should have clean straw and fresh water. And in case you’re counting down the days to spring, get an early start by checking out Permaculture Chicken: Incubation Handbook.